Ages ago I put a whole load of things that needed mending in a large laundry bag, which I then didn’t look at again until yesterday. I tipped everything out of the bag and I was pleasantly surprised to rediscover some clothes, bags and even a pair of sandals that I had forgotten about. I decided that it was time I went on that mending spree I planned to months ago (plus I promised I would mend at least 5 things this month – read more here) and I was quite excited about the prospect of being able to wear/ use the things that needed mending again. I had a kid free day and was able to just sit for hours and fix things. 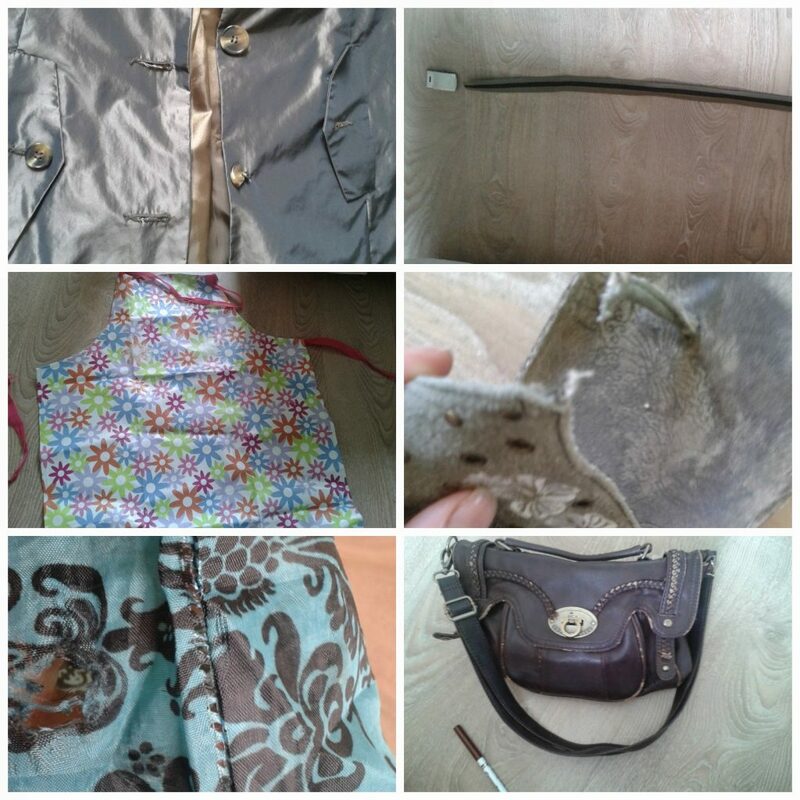 I managed to mend 12 things in total including a shopping bag, a handbag, a dress, 3 tops, a rain coat, a belt, a pair of shorts, a cardigan, some sandals and an apron! In the last few weeks I have also mended a dishwasher cutlery container and a backpack. I started off my mammoth mend with a rain coat that had a broken button, a missing button and problems with the seams under both arms. It was a frustratingly slow mend to start off with and took up the entire morning. I began to wonder whether I was being ridiculously idealistic about the whole mending thing and whether I could really justify spending hours mending one jacket. As the day went on though I felt more relaxed, the mending got easier and time flew. In the end I actually really enjoyed the day. As I was mending things I was thinking that each mend might be the first of many mends. We have a backpack (the one mentioned earlier) which we take everywhere with us when we go out with the kids and we have mended and mended it. Things wear out. Better quality things last longer and taking good care of them helps but eventually almost everything that gets used will wear out. So the mends I did yesterday may well just be the beginning in a long line of mends on each item. although I did enjoy my day of peace and quiet and mending, if I’m going to be mending things regularly it would have been more fun if I had some company (and I would be more likely to do the mending more frequently). I didn’t need to spend a whole day mending by myself, some of the mends only took me 5 to 10 minutes. I could have very easily done a mend or two an evening while watching tv with my husband. For the time being though I’m really happy that I have crossed 12 things off my mending list and I’m going to be publishing a series of blog posts showing some of the things I mended and how I did it, so watch this space! I am currently undertaking a Year of Eco Challenges . If you have a moment I would really appreciate it if you would consider sponsoring me with an action (no money involved) on my DoNation page. Also if you liked this post please click like on Facebook and follow on Twitter – thanks so much! This entry was tagged eco, Frugal, Green, making do, mend, mending, recycle, reduce, reuse, sustainable, thrifty, zero waste. Bookmark the permalink. ← What is the problem with fast fashion and a challenge for you all! The Brighton cafe sounds interesting – have you been there before? It's so satisfying mending something that would otherwise get chucked out. I've found youtube handy for things like fixing my vacuum cleaner and I keep a mini sewing kit, screwdrivers and glue handy (but not handy enough that the kids can get to them!) for quick fixes. I haven't been to the Brighton Repair Cafe yet. I have met the people who run it though and it sounds great. It is great how much information is out there about how to mend things!